Washington’s recognition of the shadow government headed by Venezuelan National Assembly president Juan Guaidó is one more demonstration of how the Trump administration has radicalized foreign policy positions and in doing so violates international law, including the OAS charter. On this issue like others, the Obama administration laid the groundwork for Trump’s radicalization, but it was usually more discrete. Obama issued an executive order calling Venezuela a threat to U.S. national security and created a list of Venezuelan officials who were sanctioned. The Trump administration’s escalation included financial sanctions against the Venezuelan government and measures against the nation’s oil industry. In addition, top administration officials have played an openly activist role by traveling throughout the continent to promote the campaign to isolate Venezuela. The first signal that the pro-U.S. international community would recognize the Guaidó government came from Washington along with its most right-wing ally, the Jair Bolsonaro government of Brazil. As of last year, Great Britain had intended to not recognize Maduro after he took office for his second term on January 10, but it intended to maintain diplomatic relations. Washington pushed for a more radical position, that of not only not recognizing Maduro but establishing diplomatic relations with a shadow government. The activist approach to diplomacy was put in evidence the day after the January 23 opposition protests, when Secretary of State Pompeyo offered 20 million dollars of “humanitarian assistance” to the Venezuelan population. Many Venezuelans see this as humiliating and nothing short of a bribe designed to pressure the country into submission. Never since the Cuban revolution, has the U.S. government played such an overtly activist role throughout the continent in favor of the isolation of a government that is not to its liking. In the process it has further polarized Venezuela and the continent as a whole. The moderates in the Venezuelan opposition, including two former presidential candidates of the two main traditional parties, Claudio Fermín and Eduardo Fernández, have favored electoral participation and recognition of the legitimacy of the Maduro government. Washington’s actions pull the rug from under the moderates and strengthen the hands of the extremists in the opposition. In August 2017, opposition parties accepted the National Constituent Assembly’s (ANC) call for gubernatorial elections in October of that year. Now most of those same parties refuse to recognize the Maduro government on grounds that the ANC, which convened the presidential elections, is an illegitimate body. The Trump administration has promoted a similar radicalization throughout the hemisphere. Most of the countries that have recognized Guaidó are on the right (as opposed to the center). But the rightist presidents of Chile (Sebasián Piñera), Argentina (Mauricio Macri) and Brazil (Michel Temer) rejected the statement by OAS secretary general Luis Almagro that military intervention in Venezuela should be considered. 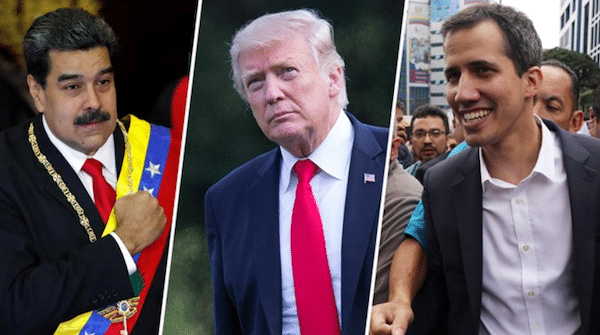 Trump, Bolsonaro and recently elected Colombian president Iván Duque have pushed these rightist presidents to an even more extreme position on Venezuela. But just as there are moderates in the Venezuelan opposition who support dialogue, which the mainstream media have pretty much ignored, there are moderates in the international community who are also in favor of dialogue. These figures include Mexican president Andrés Manuel López Obrador, Pope Francis, UN secretary general Antonio Guterres, and the UN’s High Commissioner for Human Rights and ex-president of Chile Michelle Bachelet. What they are proposing represents the best hope for this battered nation. Steve Ellner has taught economic history and political science at the Universidad de Oriente in Puerto La Cruz, Venezuela since 1977. He is the author of numerous books and journal articles on Venezuelan history and politics. He is currently coordinating an issue of Latin American Perspectives titled "Progressive Governments and Class Strategies in Latin America: Populist and Pragmatic Policies in a Broader Context." Follow Ellner on Twitter @sellner74.